Hey, guys, it's time to decorate the tree! What tree? Are we getting a Christmas tree? Cool! This is the tree, right here. You can't have a ficus for a Christmas tree. Is there tinsel? I don't see any tinsel. No tinsel? 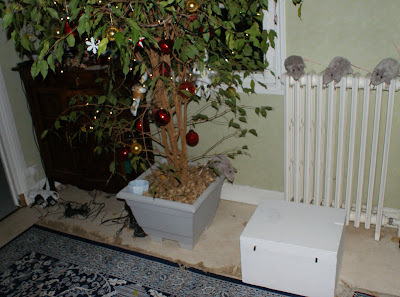 We have to decorate a ficus and there's not even tinsel! There's lot's of fun stuff in here. Really. It'll look great. I dunno, Ingmar. I think it needs tinsel. Maybe some bits of cheese. Let's lock Maurice in the box with his so-called "ornaments"
C'mon guys, let's get some cans of that fake snow stuff and go tag the neighborhood! What will they get up to next!? Very creative critters.